Bermuda is a truly wonderful destination for many reasons, and we are so excited to be arranging our guest’s trips for the America’s Cup next June. We’ve compiled a list of Bermuda facts so that we can share a bit of our knowledge on this warm and sunny slice of heaven. 1. Bermuda is the oldest and most populous British Overseas Territory (it became a British colony in 1707), and the British influence is everywhere. 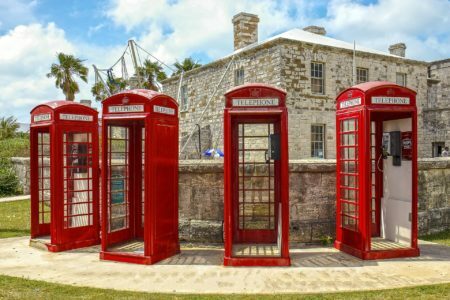 You’ll see traditional red mailboxes and phone booths around Bermuda, and you can shop at British chain stores in Hamilton. They also drive on the left hand side of the road in Bermuda. 2. There are more than 300 wrecks that you can dive around in Bermuda, and diving conditions are fantastic because those wrecks have turned into perfect artificial reefs teeming with tropical fish. 3. Bermuda is home to the oldest surviving Anglican Church in continuous use outside of the British Isles. St Peter’s Church in St Georges dates back to 1612, and the oldest remaining parts of the current church were built in 1620. 4. Locals drink rum, and Cockspur tends to be the rum of choice (though they’ll refer to it as “Rooster”). Want a strong cocktail? Ask your bartender to mix you a “Bumper,” and he’ll pour you a stiff one. 5. You can create your own custom scent or buy something gorgeous that reminds you of the Island at Lili Bermuda perfumery in St Georges, which has been operating for 85 years and is home to a fascinating perfume museum and gardens too. 6. Men in Bermuda sport knee length shorts and long socks with their suit jackets for formal wear, and with t-shirts for casual. Bermuda shorts are everywhere, and the locals manage to pull the look off brilliantly. 7. There are more golf courses per capita in Bermuda than anywhere else. The island only covers 21 square miles but there are six championship courses to play, and they are stunningly beautiful. 8. Bermudans proudly refer to themselves as Onions, a moniker that comes from the popularity of sweet Bermuda onions as an export in the 1800s. 9. You won’t be able to rent a car on Bermuda as a visitor, but taxis are plentiful and you can whizz around the island on a rented moped. 10. When you order a fish sandwich on the island, it’ll come served on raisin bread with spicy fries and it is absolutely delicious! There’s so much incredible seafood on Bermuda, you’ll be spoiled for choice. 11. You’ll see Dark “n” Stormies served everywhere, and they’re a perfect mix of Gosling’s Black Seal Rum and Bermuda ginger beer. 12. Bermuda is actually made up of 151 coral covered islands, and those famous pink sands are pink due to the high concentration of red animals that live on the coral in them. 13. Although this is the first time that Bermuda will host the America’s Cup, there are in fact many sailing events that happen there throughout the year. Two more big races are the Annapolis Bermuda Ocean Race which happens June 10th through 17th, and the Newport Bermuda Race runs from June 17th through 25th. 14. You’ll find duty free pricing in the boutiques in Hamilton and St Georges, which is why many tourists buy big-ticket items such as watches and jewellery when they visit. 15. There are 34 glorious pink sand fringed beaches in Bermuda, most are public, and you can snorkel off of most of them and see amazing fish and underwater life right there close to the shore. 16. The deep-sea fishing off the coast of Bermuda is superb, and there are lots of charter companies that’ll take you out to haul in snouted marlin, Bluefin tuna, wahoo, and other big fish. 17. Bermuda has networks of stunning underground caves that you can tour, and even swim in some at the Grotto Bay Beach Resort. 18. Drinking at the historic Swizzle Inn (established in 1932, but housed in a 17th century roadhouse) is always fun, and they have a great trivia night on Thursdays. Be careful about drinking too many Rum Swizzles there though – this potent blend of rum and fruit punch has a real kick to it! 19. One rather lovely British tradition that Bermudans heartily embrace is that of afternoon tea, and you can enjoy a splendid one at the Fairmont Hamilton Princess complete with fresh baked scones and jam, teeny sandwiches, and petit fours. 20. The Bermudan people are friendly and welcoming. Incredibly polite, they’ll great you with a heartfelt good morning and afternoon, and in general go out of their way to help visitors. Ready to book your America’s Cup package and explore beautiful Bermuda with us? Contact us now to start planning your dream trip to the Island.